For Valentines day I wanted to make little crayon molds with Jambi for her classmates. I thought it would be a fun craft project to do together. This was also going to be a great recycling victory and I was so pleased about that. Here is how it started. Every restaurant that ever had a kid darken their doorway has adopted a practice of giving out a kids menu and a pack of four crayons. 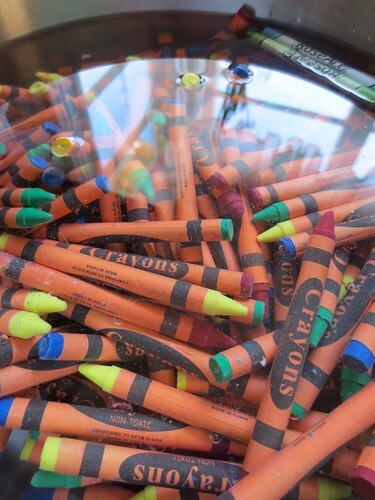 I would watch at our dinners how many crayons got left on the tables and then were pitched when the table was bussed. The waste was mind blowing (to me anyway). So, I spoke with the manager and asked if they could collect the crayons for me, promising I would be back before the pile got out of hand. Sure enough, he agreed and I got a bag of crayons, and then another, and then another. I was rubbing my hands together like a starving woman in front of a Thanksgiving dinner. I rescued all these crayons! Wow! The possibilities were ENDLESS! I could make those crayons-dripping-down-canvas pictures. Or melt them into Lego molds. Or make them into hearts for a little class party. … Oh my, so many choices! I started WAY out ahead of time, so this was not a “night before” panic situation. The first step was to get the paper off the crayons. We peeled them with our fingernails. That works, but it is not a solution for 200+ crayons. So I had the brilliant idea to soak them. Then I tried to score the paper and get them off that way. The results were not better than doing them by hand. Argh. It was not faster and it was not cleaner. It was just a frustrating soggy mess. The cheap crayons had TONS of glue and that was going to stick wet or dry. Here are some “good” ones. And it took a LONG time for them to get like that. There were a precious few Crayola crayons in the bunch and look how clean they are. 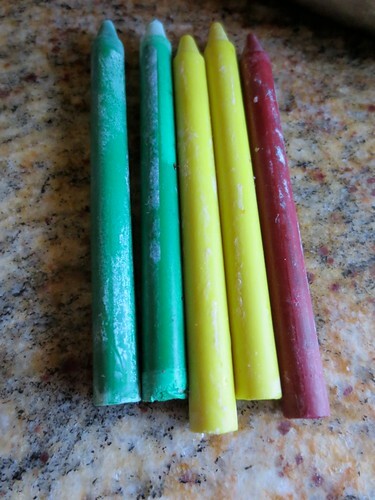 I took the few peeled crayons, broke them up, put them in a mold and into the microwave. Now, I am not sure what compound these crayons are made of, but it is not wax. It might be recycled Barbie dolls. Or old milk cartons. 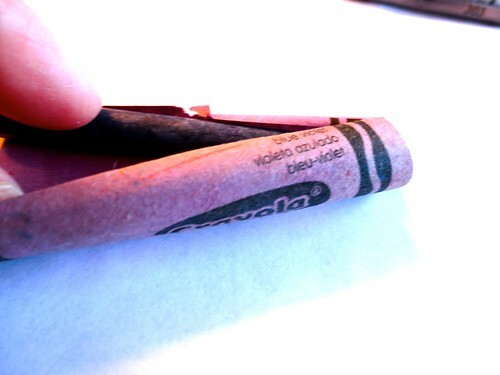 These crayons DO NOT MELT. Two minutes, three minutes, four, five six, didn’t do it. Seven minutes in the microwave on HIGH, and these suckers were not even sweating. Enough. I tried another project where I heated a baking sheet as hot as I dared to, turned it over on hot pads on the counter, and spread butcher paper over it. Then I gave Jambi a crayon to do a “melting” picture. (It was a VERY supervised project, and I only have one kid, and I could almost touch the cookie sheet without burning myself. Fear not for our safety. But if you have younger kids or lots of kids or kids who do not always remember instructions, I would caution you on this encaustic endeavor.) Guess what happened. Not much, that’s what. It was pretty much the same as regular crayon on paper. Not worth one minute of the hassle. At this point here, I had tried wet, dry, wet heat, dry heat… I was done. Put a fork in it. I took the rest of the crayons out of the water and dried them on a kitchen towel. Then I bagged them all up, and I took them into the kindergarten class. I let our beloved kindergarten teacher know the provenance of these crayons. She smiled a huge smile at my crafty fails and accepted them for coloring. 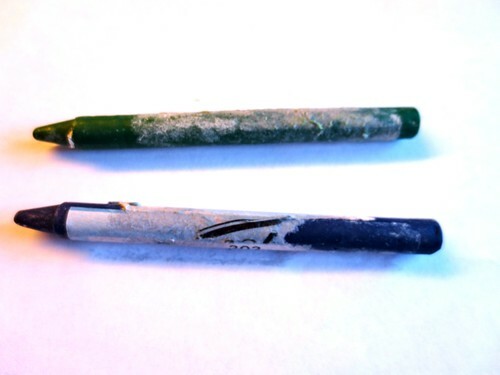 The moral of this tale: all crayons are not created equal. 4 years ago by Susi in Crafting with Kids , Crafts , Crafty Mom , Reviews , Tools | You can follow any responses to this entry through the RSS feed. You can leave a response, or trackback from your own site.